L’ôzeki Goeido a subi sa première défaite du tournoi perdant au passage la tête de la division. 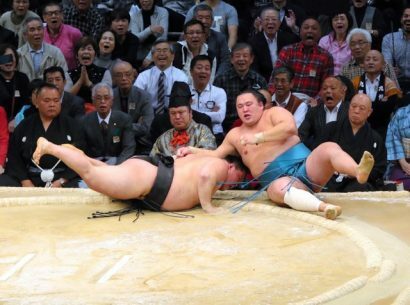 Les espoirs de Goeido pour être promu yokozuna ont subi un coup quand Tamawashi a condamné l’ôzeki à sa première défaite du tournoi ce vendredi. 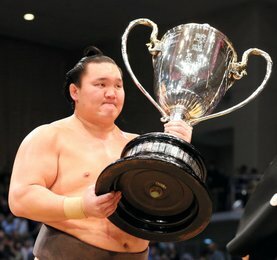 Le retour du grand champion Hakuho sur le dohyô a également été bouleversé laissant le yokozuna Kakuryu désormais seul en tête du championnat avec 6 victoires. La première défaite de Goeido contre le komusubi Tamawashi qui l’a poussé vers le sol pour remporter son quatrième match entache les chances de promotion de l’ôzeki. Huit lutteurs se partagent désormais la deuxième place du classement au score de 5-1. 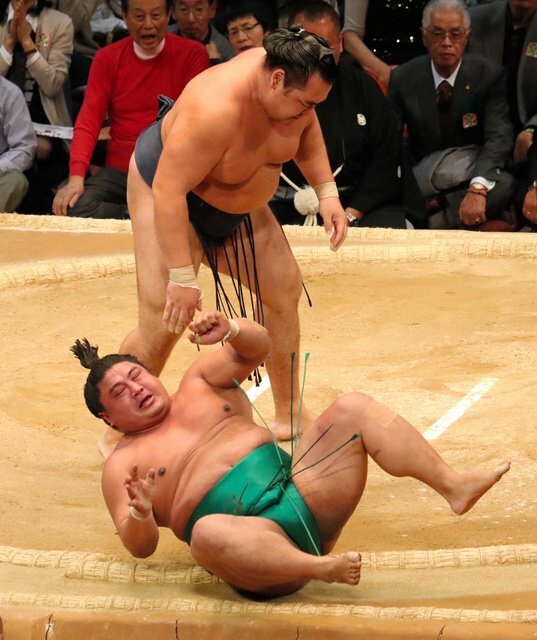 Tamawashi avait débuté ce tournoi par une victoire sur le yokozuna Harumafuji avant de battre deux ôzeki : Kotoshogiku mardi puis Goeido aujourd’hui. Kakuryu conserve son invincibilité avec une victoire sur le maegashira 2 Yoshikaze, tandis que Harumafuji a battu le maegashira 3 Shodai. La grande surprise du jour est sans aucun doute survenue lors du combat final. Hakuho s’est retrouvé expulsé sans ménagement du dohyô par le maegashira 3 Endo obtenant à la même occasion le second kinboshi de sa carrière. 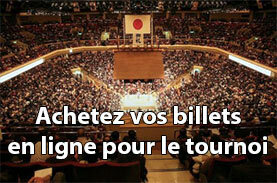 Très en forme avec un impressionnant 13-2 en septembre, Endo a déjà vaincu trois ôzeki et fera face demain à Kakuryu. Le yokozuna Hakuho n’a rien pu faire pour résister à la charge du maegashira 3 Endo. Dans les autres combats des rangs supérieurs, l’ôzeki Kisenosato a obtenu une victoire de routine par yorikiri contre le komusubi Mitakeumi. L’ôzeki Terunofuji a remporté son combat contre le maegashira 1 Tochiozan, tandis que Kotoshogiku s’est imposé par watashikomi contre le sekiwake Okinoumi. Le maegashira 14 Sokokurai sort également du peloton de tête en subissant sa première défaite du basho contre le maegashira 12 Chiyootori. Aoiyama est parvenu à sa première victoire du tournoi en faisant tomber le sekiwake Takayasu à 3-3. L’arbitre avait d’abord attribué la victoire au bulgare mais les juges ont décidé que les deux hommes étaient sorti en même temps de l’anneau les obligeant ainsi à refaire le match. Dans la division jûryô, Osunaarashi préserve toujours son avance sur ses concurrents. L’égyptien, toujours invaincu, est suivi par quatre lutteurs qui n’ont qu’une seule défaite. 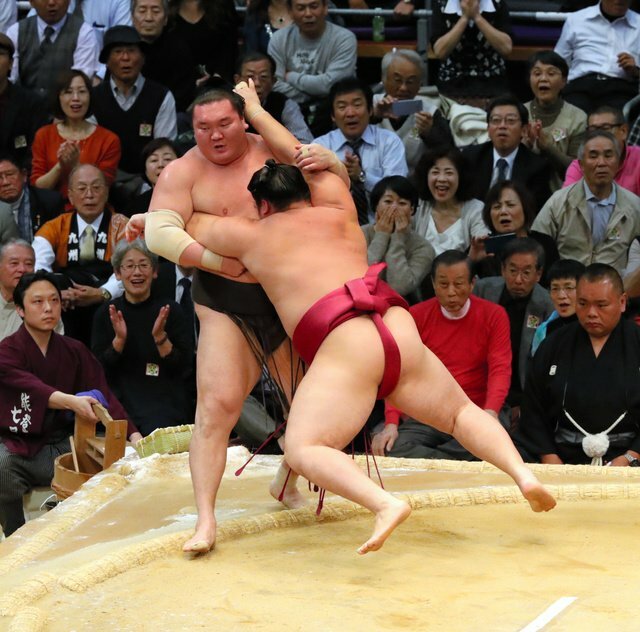 Goeido’s hopes of promotion to yokozuna suffered a blow when Tamawashi sentenced the ozeki to his first defeat of the Kyushu Grand Sumo Tournament on Friday. Returning grand champion and joint overnight leader Hakuho also suffered an upset, leaving Mongolian yokozuna Kakuryu in sole possession of the lead at 6-0 at Fukuoka Kokusai Center. Goeido was on the back foot from the charge after komusubi Tamawashi (4-2) steamed in with the first of two strong head butts, the second leaving the ozeki with a bleeding forehead. Goeido never looked like finding a way back into the bout and Tamawashi finished the job when he thrust him down to the sandy surface. 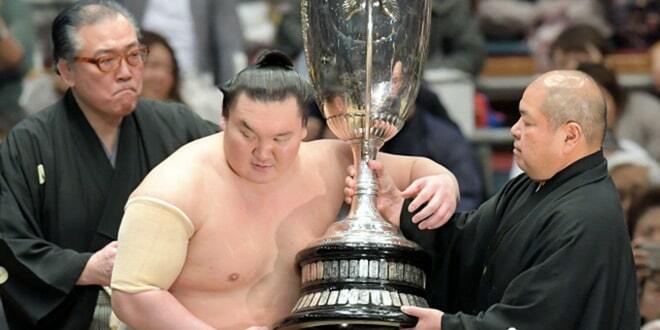 Goeido’s and Hakuho’s defeats dropped them into an eight-way tie for second place. 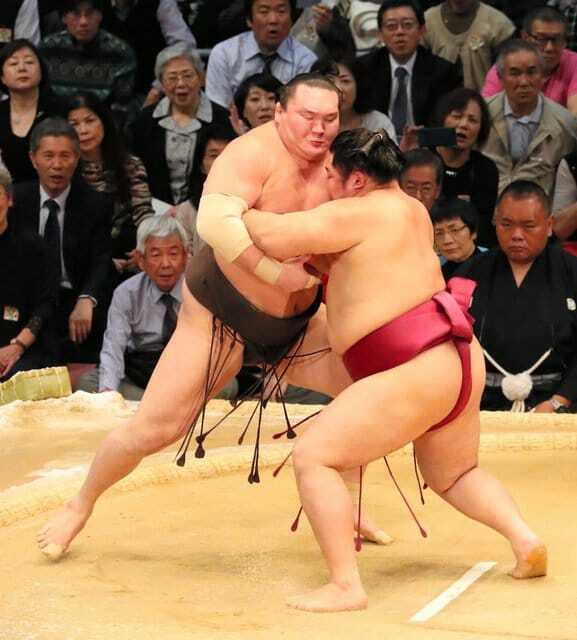 Tamawashi kicked off his tournament with a win over Mongolian yokozuna Harumafuji, and his victory over Goeido was his second against an ozeki, having beaten Kotoshogiku on Tuesday. Goeido is aiming to reach sumo’s top rank after a stunning maiden title win at the Autumn meet in September, when he went 15-0 despite wrestling with his rank on the line. 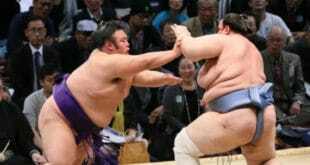 Kakuryu maintained his unbeaten start with a slap-down win over second-ranked maegashira Yoshikaze (1-5), while Harumafuji (5-1) worked third-ranked maegashira Shodai (4-2) toward the edge with a throat grip before bumping him over the edge. But Hakuho, who missed the last tournament through injury, came a cropper in the day’s final bout when he was bundled out of the dohyo by third-ranked maegashira Endo (4-2). In other bouts in the upper ranks, veteran ozeki Kisenosato posted a routine yorikiri force-out win over komusubi Mitakeumi (1-5) for his fifth win. 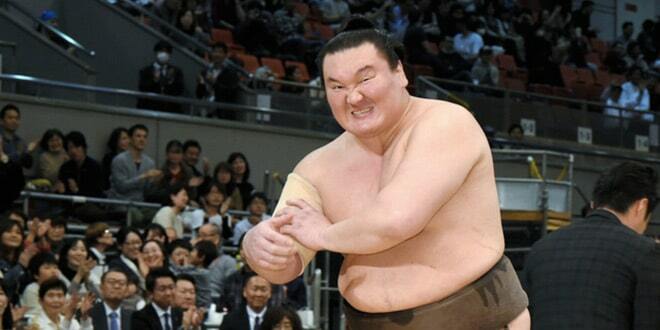 Ozeki Terunofuji (4-2) outlasted top-ranked maegashira Tochiozan (0-6), while New Year champion Kotoshogiku saw off sekiwake Okinoumi (1-5) with a watashikomi thigh-grabbing push down to level his mark at 3-3. Chinese No. 14 maegashira Sokokurai saw his perfect start end when he was muscled over the ridge by 12th-ranked Chiyootori, who improved to 4-2. Bulgarian No. 1 maegashira Aoiyama got it right at the second time of asking and finally chalked up his first win of the tournament, outgrappling sekiwake Takayasu, who dropped to 3-3. The referee had initially awarded a win to Aoiyama, but ringside judges decided that both men had gone out of the ring at the same time and ordered a rematch.